The Hoover Enhanced Clean Handheld Steam cleaner is one of the few hand held/portable steamers that pack a powerful punch. We have already covered the Hoover Enhanced Clean Canister steamer, which is one of the newer offerings from the most popular brand in home cleaning. Similarly to the canister model, this steamer is small, compact and beautifully designed in a striking blue and white design. Unlike many other hand held steamers, the Hoover Enhanced Clean Handheld Steam cleaner actually allows you to clean both with steam alone or with added disinfectant. If you have been looking for an all purpose cleaner that offers a little more than what the traditional hand steamers from Shark and Haan offer, then you need to read this review. The first thing to note is that the disinfectant solution that comes with the steamer is NSF approved and EPA certified AND it is also a hospital grade cleaner! This means that you don’t have to rinse the cleaned surface before eating which is definitely a relief and time saver especially for folks who are conscious about chemicals in their home. Using this steamer you can get rid of harmful bacteria such as e coli, influenza, salmonella, staph, H1N1 (swine flu) and more with a 99.9% success rate. The Hoover Enhanced Clean Handheld Steam cleaner also comes with a two tank system which separates the disinfectant cleaning solution from the water that is turned into steam. This ensures there is no unwanted mixing of the two and you can control which one you want to use at any given time. Also, there are tons of attachments and accessories that allow greater flexibility and usage than ever before. Some of these attachments include cleaning wand and pads, various brushes, scrapers, focus cleaning tools, wedge tool and pads, wire brushes, nylon brushes and more. • 20 Foot cord length which is more than sufficient to clean just about anywhere without having to get an extension cord or unplug. • Takes approximately three to five minutes to heat up before it is ready for use. • Indicator light which lets you know when the machine is ready to be used. • Has a clean control dial, just like the canister type model which allows you to control the amount of cleaning solution used in steaming or heated cleaning. • Relatively light weight when full at six pounds which is definitely light enough for comfortable use. • Ergonomic and comfortable handle which makes it easy to hold. • Costs between $80 – $120 on Amazon. Click here to see the latest price. 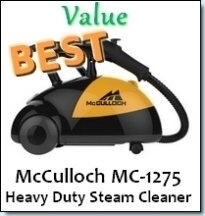 About The Hoover Enhanced Canister Steam Cleaner? Well, first of all, this machine has garnered an impressive 4.5 star rating out of 5. 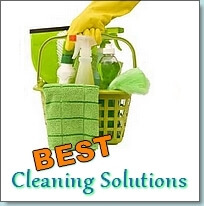 This is quite impressive since few cleaners have been able to obtain such high recommendation from consumers. We will now look at a summary of all the reviews, separated in the “Good” and “Bad” highlights. 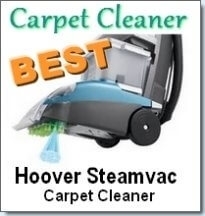 Consumers found that the Hoover Enhanced Clean handheld steamer had a lot of muscle and was able to steam away years of dirt, grime and hardened muck. Many were able to breathe new life into their linoleum floors, shower and fridge handles, grout, tiles, bathtubs, ceiling fan blades and so much more. Many customers absolutely loved the wide variety of attachments which make it truly multipurpose. You can even use it to steam your clothes and furniture as well as get wrinkles out of the curtains and other fabrics. It has a carry bag which allows you to quickly and easily pack it away and all of the attachments when not in use. Great for cleaning animal toys. Very sturdy construction that is easy to set up and use with an “on” and “off” button. Many consumers mentioned that they preferred this Hoover over the Shark handheld. Unfortunately, one problem that seems common to many steamers and this Hoover is no exception is the lack of steady steam throughout. Instead, some people found that it would produce steam, then sputter a little and then continue steaming. This can cause a little extra water on the floors, so be sure to move any items away from the area that you don’t want to get wet and possibly have a cloth to wipe away any excess water. Some people have found that the brushes were not the greatest quality and got worn out within a few hours of heavy use. You will have to hold down the lever/trigger when steaming as it does not have a lock in place mechanism. This shouldn’t be a problem as it wasn’t meant for hours of cleaning at a time, but rather minutes. Overall, the Hoover Enhanced Clean Handheld Steam Cleaner is actually quite surprising in the category of hand held or portable steamers. It offers excellent value and definitely outperforms some of the other, more popular brands in this category. 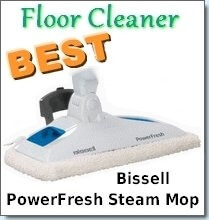 Portable steam cleaner reviews and a quick model overview of the portable home steam cleaner.